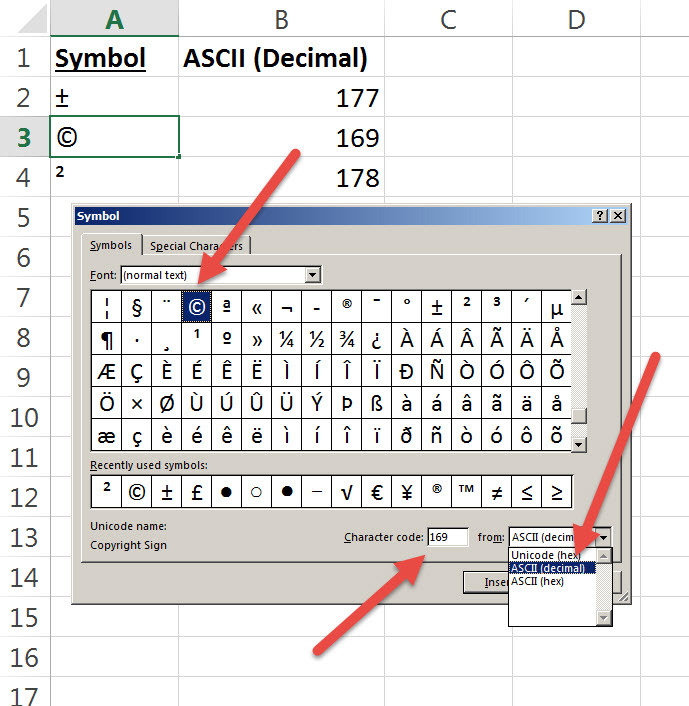 If you regularly work with Excel and use it to make estimates, reports, quotes etc you may need to make use of symbols that are not available on the keyboard e.g. plus minus ( ± ), copyright ( © ), metres squared ( m² ) etc. What are the ways to enter these symbols, and is there a shortcut to insert a symbol in Excel? If you want to insert a plus minus sign on a report, you can go to the INSERT tab and click on the Symbol button. 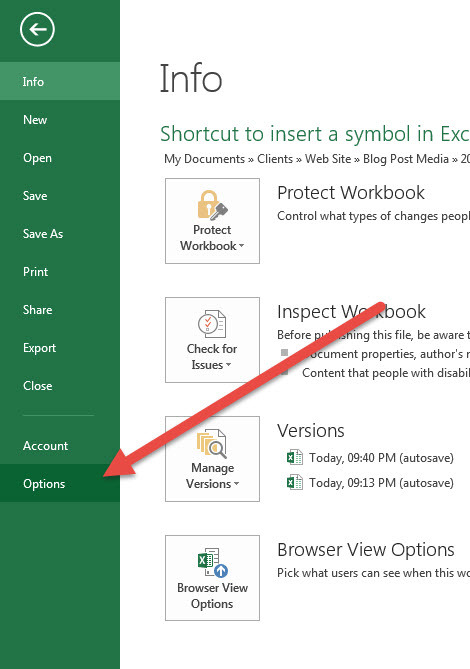 Then choose the symbol you want and click insert and it will be inserted as shown below. If you have few symbols you use, you can make use of the ASCII codes provided in the symbol dialogue box and use the ALT key. If we want to insert a copyright sign ( © ), you can look in the Symbol dialogue, click on the copyright sign and change the FROM to ASCII (decimal). Note that in the character code it says 169. So to get a © , you hold ALT and type 0169 and you will get the © symbol. Perhaps make a list of the ones you use, print it out, laminate it and put it on your desk for quick reference. 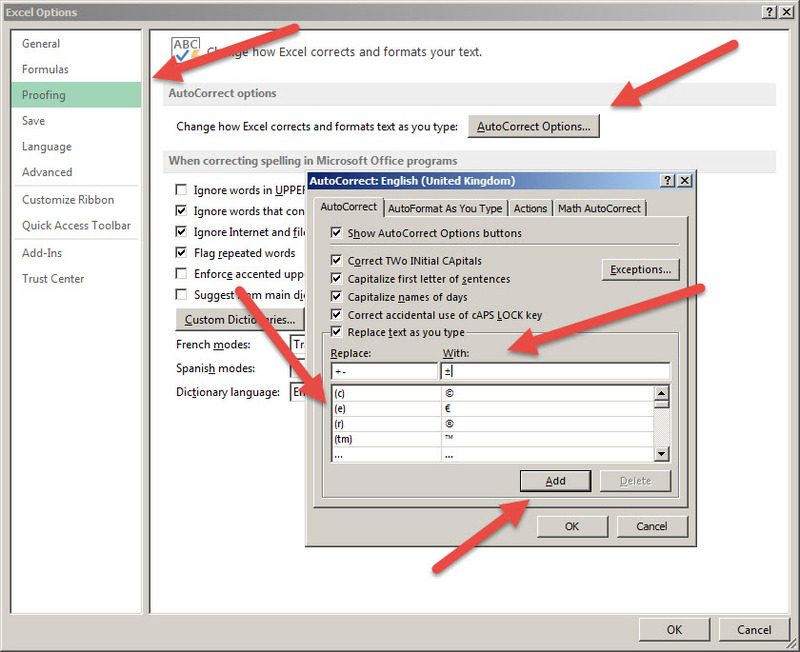 If you don’t want to remember all these shortcodes, you can set up the Auto Correct feature in Excel to immediately convert something you type e.g. (c) into ©. Under the proofing option, you will see an option for Autocorrect. If you click on this, a list of all the current autocorrects are shown (see below). Note that some of the ones we discussed above are already there. So if you type (c) with a space afterwards, it changes to the copyright symbol. If we want to add our own, we can type into the REPLACE and WITH boxes. Now whenever you type +- with a space after it will change to the plus minus symbol. This is also very useful if you notice that Excel keeps changing what you mean. We have a client called IHS but whenever we type this Excel converts it to HIS. This is where we would correct this.